I think they will have to upgrade runway, taxiway and apron if they want to see Emirates widebody aircraft at Faisalabad Airport. Abbas Ali wrote: I think they will have to upgrade runway, taxiway and apron if they want to see Emirates widebody aircraft at Faisalabad Airport. Would the A330's be capable of coming to LYP? ^ I think A330 with normal passenger/cargo load cannot be used at Faisalabad. Shaheen Air used A320 for Hajj flights from Faisalabad and I think it means it was not possible for them to use A330 for Hajj flights from Faisalabad. Emirates used to operate A310 for Peshawar and before phasing out A310 from the fleet Emirates spent money to get Peshawar Airport runway upgraded to enable operations of its A330 and B777 aircraft at that airport. As Qatar airways, Air arabia and flydubai has announced their scheduled fligjts from Faisalabad, it will caused a rapid growth in passemgers at once. Can current infrastructure handle expected load?? ^ For the time being, they are going to expand passenger lounge to meet air traffic growth. In today's (August 12) newspaper. Pakistan Civil Aviation Authority (CAA) is planning to undertake the subject works in order to improve, expand and renovate the existing terminal building and upgrade the existing apron at Faisalabad International Airport, for convenience of the passengers. Expansion of existing arrival, briefing and departure lounges. Airports Security Force (ASF) stamping counters. Rehabilitation and extension of existing apron by overlaying of 12 inch thick Pavement Quality Concrete (PQC). Relocation / extension of utilities like water supply, plumbing & sewerage etc. Construction of generator room, pump room and boring for submersible pump. Provision of roads and double gate security system. Internal and external electrification fittings and fixtures. Provision of air conditioning system. Provision of submersible plumbing set and non-clogging centrifugal pump. Provision of fire alarm system. Provision of fire hydrant system. Provision of net working facility. Provision of Closed-circuit television (CCTV) system. Flights information display system (FIDS). Flights enquiry Interactive voice response (IVR) system. Public announcement system / sound system. Electronic private automatic branch exchanges (EPABX) system. Digital voice logging system (DVLS). On December 24, 2015, foundation stone was laid by Director General Pakistan Civil Aviation Authority (CAA) Air Marshal (Retd.) Asim Suleiman for expansion and renovation of Faisalabad International Airport. What would be estimated cost of this project? what would be tentitive completion time? BTW I have a question in my mind. I think LYP used to have very few international flights, that too during hajj seasons and I don't think there were any other commercial airline operating on international routes for decades. How come with in months FZ, QR and Air Arabia all started their operations from LYP, the potential was always there I guess, were they waiting for someone to break the ice? Same goes for MUX as well but there we can give credit to the up gradation of the Airport. 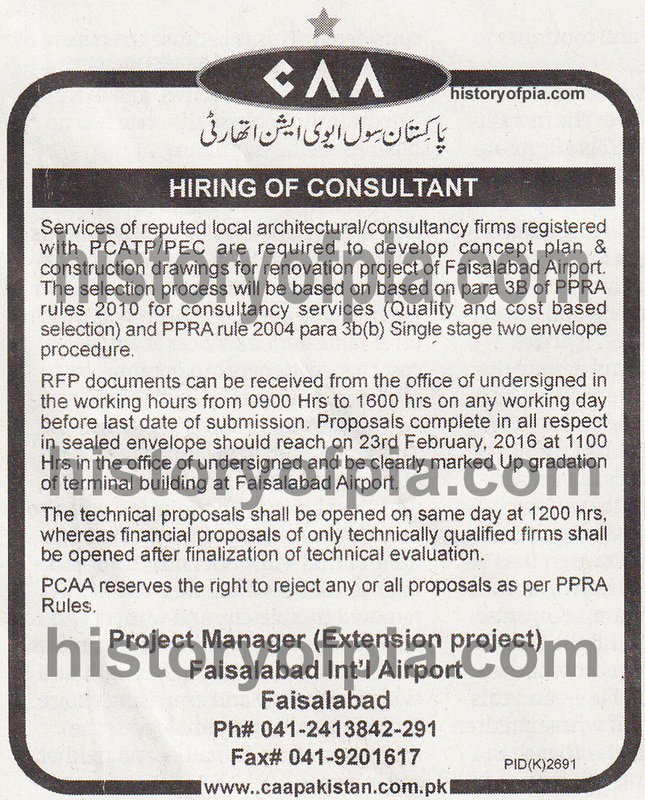 Services of reputed local architecture/consultancy firms registered with Pakistan Council of Architects and Town Planners (PCATP) / Pakistan Engineering Council (PEC) are required to develop concept plan & construction drawings for renovation project of Faisalabad Airport. The selection process will be based on para 3B of Public Procurement Regulatory Authority (PPRA) rules 2010 for consultancy services (quality and cost based selection) and PPRA rule 2004 para 3B(b) single stage two envelope procedure. Photos of new taxiway construction at Faisalabad Airport. The upgraded/expanded Faisalabad Airport terminal building will be equipped with jet bridges, according to an article in today's newspaper. Terminal building expansion work photos.